For generations the most famous name in pistols has been Luger. There is no country however small or insignificant in which that name, or its foreign counterpart, Parabellum, is unfamiliar. To make the statement that it is the world’s finest, most accurate, well designed or generally the “best” pistol would merely be expressing an opinion, but what are the reasons for its popularity? Why has the Luger pistol been accepted as the “best” and what is the story behind its phenomenal success? To relate the tale from the beginning we must go back to a well known arms designer of his day, Hugo Borchardt, a naturalized American citizen. Borchardt was a mechanical genius of some note, for he not only entered the inventing profession at an early age but also developed many diversified types of mechanical devices. His first patent, for a bullet grooving machine, was issued on July 21, 1874. This was followed by a bullet patching machine in 1875, a breech-loading firearm (Sharps-Borchardt) in 1876, a gun sight in 1877, another breechloading firearm, a shirt neck shaper, a magazine; rock driller; wire straightener; recoil magazine pistol (Borchardt Pistol, 1893), and numerous others. Borchardt was versatile indeed, but it appears that his many patents added few coins to his coffers, for he was constantly changing jobs and addresses. His part in developing the Sharps-Borchardt rifle was his greatest achievement before forsaking his adopted country for Europe, where he remained for the rest of his life. He did not, however, give up his American citizenship. Georg Luger was born in Steinach in Tirol in 1849. Originally an officer in the Austrian Army and with a decided liking for mechanical things, he became acquainted with Herr Mannlicher, inventor, among countless other designs, of the Austrian Infantry Ordnance Rifle. Together these two wizards produced an automatic, army rifle, (Luger’s military career was at an end) opening the door to a new vocation, one that was to make Luger world renowned. In 1891 Luger held a position with the firm of Ludwig Loewe of Berlin, from whence he was sent shortly thereafter to exhibit yet another military rifle in the United States, and where he more than likely first met Hugo Borchardt. It is known that Borchardt left the United States and took a position as director of the Hungarian Arms Company, but he soon had a disagreement with the Hungarian War Minister, General Fejervary, and undoubtedly through the influence and persuasion of his new friend, Georg Luger, was offered a job with Loewe, which he accepted. The next we hear of Herr Luger is in the year 1894 when he is once again exhibiting a new weapon before the United States Naval Ordnance Board. That new design was a semi-automatic pistol named after its creator, Borchardt! The Borchardt Pistol was patented in all of the major countries between 1893 and 1896. Sometime in 1893 the “Automatic Pistol, Borchardt Patent” was offered for sale on the commercial market to the world at large. It was of the finest precision workmanship and only the very best materials were used in its construction. The pistol carried a beautiful, glossy satin finish. The barrel was approximately caliber 30, using a special bottlenecked cartridge. This cartridge was the forerunner of (and interchangeable with) the well known caliber 30 (7.63mm) Mauser round. It is also almost identical to the 7.63mm Mannlicher Pistol cartridge, Model of 1896. The Borchardt was sold in the United States for $30.00 – that price included a wooden shoulder stock with detachable cheekpiece, leather holster, 3 spare magazines, a wooden dummy magazine which included tools, ramrod and oiler and an instruction manual. For an extra $5.00 a fitted leather case was included. Unfortunately, few of these complete outfits remain intact today although they may be encountered from time to time in some of the larger collections. The Borchardt Pistol was originally marketed by the Loewe firm but soon after the weapon was placed on the market, that company absorbed the Deutsche Metallpatronenfabrik of Karlsruhe, forming a company thereafter known as the Deutsche Waffen and Munitionsfabriken of Berlin-Karlsruhe (January 1, 1897). After that date all weapons were manufactured at the DWM plant in Berlin, and only ammunition was made at the Karlsruhe subsidiary. It is interesting to note that it was Georg Luger and not Hugo Borchardt who brought the pistol to this country for these tests. Notice that the cartridge is indicated as being of the “LUGER rimless type” which leads us to believe that Georg Luger might have had more to do with the marketing of the pistol than is generally believed. Also of interest is the fact that although the press gave it an excellent notice the U. S. Navy failed to follow up the tests with any further trials of the Borchardt Pistol. The U. S. Army also tested the Borchardt, for the Chief of Ordnance ordered a board of officers to meet at Springfield Armory on October 20, 1897 “to make a thorough test of, and report upon, a Borchardt Automatic Pistol Carbine.” This test was not pursued further so it may be assumed that the pistol did not meet with the complete approval of the officers on the board. Georg Luger was more than an employee of the new firm of DWM. He received a handsome salary, could patent all of his inventions at company cost and had all of his traveling expenses cared for by the firm. Having no definite office hours, he was more of a partner with a fixed salary and a lengthy contract. After five years his salary was doubled and his contract extended. A point of interest which should be interjected here is that Luger spelled his name exactly that way. LUGER, and not LUEGER or LEUGER as has been erroneously quoted. His personal signature, as early as 1896, bears this out, and members of the Luger family do not recall the name ever having been spelled any other way. According to close friends and relations, Borchardt and Luger were the best of personal friends though they often had their differences at the factory. Years after the deaths of their husbands the two widows were constant companions. Luger had a son, Georg, Jr., who lives today in Berlin at the age of 81, and who has been of invaluable assistance to the author in bringing to light many of the facts concerning the Luger Pistol and its famous inventor. Herr Luger, Jr. was a famous pistol shot, with a Luger, of course, though he modestly disclaims any outstanding ability. His life was spent with much larger and more complicated weapons than those produced by his sire, namely torpedoes. Excellent though it was, especially in relations to the other pistols of its day, the Borchardt left a great deal to be desired. The inventor believed his gun to be perfect, though, and so steadfast were his refusals to redesign even the smallest component that DWM, the manufacturers, called upon Herr Luger to make the desired changes. This he did in the following manner. The strong and sturdy action of the Borchardt was retained along with many other of the original features, some being altered slightly and others quite radically. The barrel, though shortened, maintained its long, slim appearance. The grip was inclined at an angle to the receiver and the recoil spring was incorporated in the grip, thereby doing away with two major problems, the angle of the grip and the bulky, protruding, recoil spring housing. The trigger and trigger cover were altered, the latter now completely concealing the rollerpin of the sear and partially covering the sear itself. The position of the ejector was changed from beneath the breechblock to the right side of the receiver, while the extractor remained unchanged. The lanyard ring was moved from the left side of the receiver to the rear, just above the grip safety, a new feature. Buttstock and toggle-knob were completely done away with and all screws, with the exception of the ones holding the wooden grips to the frame, were replaced by pins. The sights remained unchanged. In the latter part of 1898, November 24 to December 8, a series of pistol trials were held at Bern, Switzerland by a board of army officers. Other pistols entered were: Mauser with 10-shot magazine, Mauser with 6-shot magazine; Bergmann with 10-shot magazine; Borchardt-Luger with 8-shot magazine; Roth with 10-shot magazine; Mannlicher with 7-shot magazine. Explanation, assembly and firing of 50 rounds followed; then timing per firing of each weapon; target shooting, 3 frames each at 50 meters; endurance of 400 rounds without cleaning or cooling, etc. The Borchardt-Luger was the only weapon in the endurance test to perform satisfactorily. Then followed dust and water tests, and the firing of 20 rounds in each weapon. Again the Borchardt-Luger was the only weapon without malfunction. The point of greatest interest is the fact that the pistol is referred to as the “Borchardt-Luger.” This was a transition piece, a true cross between the Borchardt and the Luger which was to evolve from this and a later Swiss test. In contrast to the Borchardt, the “Pistole Parabellum,” or “Parabellum Automatic Pistol, Borchardt-Luger System, Swiss Model 1900,” was all that had been expected of it. The weight had been decreased from 40 to 30 ounces, the barrel length from 7? to 4? inches and the overall length from 14 to 9 inches. Also, because greater accuracy could now be got from the pistol, the buttstock was no longer necessary and thereby lessened the weight by another 15 ounces. The Model 1900 was the first weapon to bear the famous scrolled DWM, trademark of the Deutsche Waffen und Munitionsfabriken of Berlin, where all earlier models were made. A note of interest is the origin of the name “Parabellum,” thought to derive from a Latin phrase, Si VisPacem Para Bellum. Translated into German this became Bereite Den Krieg vor Parabellum, or in English, “If you Want Peace, Prepare For War.” Consequently, as the pistol was intended as a military weapon, the “For War” or “Parabellum” name came to be coined. It is known throughout the world today by that name. In mentioning the name “Luger” to a European, with the possible exception of the English, do not be surprised to be met with only a blank stare! The name “Luger” was first applied to the pistol by Hans Tauscher, first representative for the Borchardt and Luger Pistols in the U.S., and later, after World War I, was registered by the post-war importer, A. F. Stoeger; consequently, the name “Luger,” although not an American name has become an American term! In some instances the name “Borchardt-Luger,” “Borchardt-Luger Parabellum” and designations such as “P.08” (meaning “Pistol, Model 1908,” the year the Germany Army first adopted the Luger), “M943,” the Portuguese military title, “Pistole 1900,” the Swiss version, etc. may be encountered. The Model 1900 became a success overnight. On April 2, 1901, the Swiss “Bundersrate,” or governing body, officially became the first to adopt it by placing an order with DWM for 3000 pistols. On April 16, 1901, the Commanding Officer of Springfield Armory was officially directed to purchase 1000 Lugers for test by troops of the United States Army! Rock Island Arsenal was directed to fabricate a sufficient quantity of russet or black leather holsters and hardened steel combination tools. The 1000 pieces purchased by the U.S. were marked with small ordnance-bomb proofs, and most of the holsters carried the familiar “U.S.” on the flap. These pistols were the original “American Eagle” type, being so marked over the chamber. As far as can be determined these marks were unofficially stamped, and later commercial types carried on with the identical crest. Because these pistols and holsters were issued to and used by U.S. troops, they are considered by some to be U.S. martial weapons! The Swiss and Americans were not the only ones to test the Model 1900 for in 1903 and 1904 at Rosenburg, Sweden, extensive government trials found the Luger pistol and the Model 1903 Browning in the semi-finals. Although the Swedish report favored the Browning it noted that the Swiss were issuing the Luger to mounted troops. Similar reports indicate that the Parabellum was issued to German officers for use in the Boxer Rebellion in 1901. Other countries to test the Luger in those early days included Austria, Spain, Canada, Russia, Brazil, Luxemburg, Holland, Bulgaria, Norway, Portugal, Chile and several others. Between 1901 and 1906 rapid advancement was made in making the Luger a better gun, with both military and commercial markets in mind. The first modification of the original was offered in 1902, and was designated the model of that year. Few of these were produced – the type is quite scarce today – but they’ll be remembered for one outstanding reason; they were the first weapons to chamber the 9mm Luger cartridge! Now, half a century later, it is by far the most popular and widely used cartridge in the world. This was an unusual situation – the pistol itself was not successful but the cartridge flourished. Probably an accident – or could it have been planned that way? The first model to be officially adopted by the German Government was the “Marine Modell 1904,” or what has become known as the “Navy” Luger. Thus it was the German Navy and not the Army who first realized the merits of the Luger pistol. The Naval Luger has a 6-inch barrel with a 2-position rear sight situated on the extreme rear of the rear toggle link. Caliber was the new 9mm. One of the most interesting, different, costly and coveted variations of the Parabellum is the “Luger Carbine,” which was introduced about 1904 in an attempt to compete with similar weapons marketed at that time by Mauser, Mannlicher and Bergmann. With a barrel too long to be practical as a pistol and too short to meet the requirements of a rifle, it was more nearly the equivalent of a “brush gun.” The Luger Carbine is actually a Model 1900 with a heavy 11?-inch barrel recoiling within a checkered walnut fore-end, and detachable walnut shoulder stock. The 100 to 300 meter rear sight is mounted on the barrel just in front of the chamber. Despite the many rumors of special specimens with assorted differences, all Luger Carbines of the factory production lot are identical and were only produced in caliber 7.65mm Luger. A special cartridge containing one-seventh more powder and having a blackened case was developed for use in the Carbine models. The German Kaiser, Wilhelm II, because he had difficulty in handling a full sized hunting rifle due to the deformity of his left arm, was extremely fond of hunting deer on his many estates armed with his Luger Carbine. When, prior to the First World War, the President of the United States, Theodore Roosevelt, paid a visit to Germany, he was a guest of the German emperor on at least one of those hunting excursions and was presented with a Luger Carbine by the Kaiser. This gun bears a plaque denoting the presentation, and may be seen today at Roosevelt’s home in New York on display with his many other weapons. The year 1906 brought what was to become known as the “New” Model. This is a colloquial designation, not necessarily an official factory term. The part that was new in the “New” Model was the replacing of the old laminated flat recoil spring with one of coiled type. As all Lugers after 1906 have the coiled spring, they are all designated as “New Models,” and consequently all models with the flat recoil spring are called the “Old” Model. Of even greater historical interest than the U.S. Army Tests of 1901 were the trials that took place in the spring of 1907. These were the tests which led to the adoption by the U.S. Government of the Colt Automatic Pistol, caliber 45, but not before it had successfully competed and won out against the caliber 45 Luger! Records indicate that two, possibly three, of these large Lugers were personally produced by Georg Luger and brought by him to the United States for the Army Tests. Prior to his arrival, Frankford Arsenal supplied him with 5000 rounds of caliber 45 ammunition with which to experiment. Luger pulled the bullets and, with his own special powder, loaded 11mm Bergmann cases which thereby formed the 45 Luger cartridge. The tests were originally planned for the year 1906 but Luger was ill and the tests were postponed until the following year! The 45 Luger is merely an enlarged version of the 9mm Model 1902/06 with slight modifications necessitated by the use of the larger cartridge. 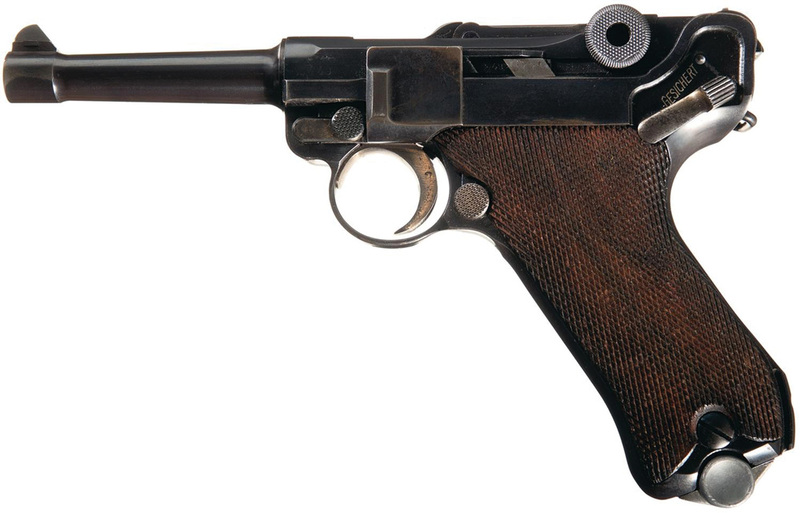 The only specimen known to exist today bears the serial number “2” and is truly a fine example of Luger workmanship. The initials “GL” appear on the rear toggle link while the absence of proof marks corroborates the fact that this was a super special experimental pistol never intended for sale. With the adoption came large orders which could not be filled in the time allotted by DWM. Consequently, the Royal German Arsenal at Erfurt was appointed co-manufacturer. Many thousands of Lugers were turned out of that great establishment, all bearing the insignia of the arsenal, a large crown surmounting the name “Erfurt,” stamped on the forward toggle link instead of the DWM trademark. Almost all DWM and Erfurt Lugers produced for the military will bear the date of manufacture and acceptance stamped into the receiver ring. A new system of numbering was initiated wherein the block of numbers never exceeded 9,999. Once that figure was reached a letter was added beneath the numbers beginning with “a” and so on through the alphabet. This letter becomes as much a part of the serial number as the numbers themselves, a point to remember when recording serial numbers on Luger pistols. Without the inclusion of the letter, hundreds of Lugers would carry the identical number and the difficulties which might arise may well be imagined. In 1914, Germany entered the Great War armed with two basic Lugers, the military Model of 1908/14 and the Naval Model of 1904/14. The military or Army Model is almost identical to the Model 1908. All types have a 4-inch barrel, stock lug, holdopen device and a letter of the alphabet following the four digit serial number. All are caliber 9mm and will have the date of manufacture over the chamber. According to unofficial sources, approximately 2 million 4-inch barrelled Military Models were produced by both manufacturers, DWM and Erfurl, during the First World War period. In addition to this staggering figure, about 50 million replacement parts were supplied. The majority of these pistols and parts were of DWM manufacture. Like the military Model, the Naval Model was also exactly the same as the earlier Navy Model of 1908 (1904/08), except for having a wartime date over the chamber. All had the 6-inch barrel, stock lug, 2-position rear sight, and a letter following the serial number. Not nearly as many Navy Models were produced due to the much smaller demands of the junior service. n 1914, a new model was introduced, “new” consisting of the fitting of an 8-inch barrel to the standard Military Model, and the elimination of the rear sight from the rear toggle link. The caliber was 9mm and the back sight, of tangent type, was on the rear of the barrel just forward of the barrel flange. In this respect, it is similar to that on the Luger Carbine, but the sight itself was not the same. It is adjustable from 100 to 800 meters in 100-meter graduations. One unusual thing about this sight is that it has built-in drift allowance to the left. In other words, when the sight is elevated, it not only moves upward but also to the left to compensate for the drift of the bullet over long ranges. Some front and rear sights are adjustable by means of a tiny set screw on the front sights of Naval models. The Model 1914, or “Long Barrelled Model” as it is sometimes called, was issued complete with a long holster, a shoulder stock and a 32-round helical, or snail, drum. It is claimed that these were issued especially to artillery troops, to machine gun units, and to auxiliary cruisers or “Z” boats in place of a rifle or carbine. The reasoning behind this move was, undoubtedly, that a lighter, smaller and more compact side-arm than the rifle was needed – one that could easily be converted into a pistol-carbine for long range firing, and be much handier for the man who had to serve larger weapons. These “Long Barrelled Models” are quite handy and extremely accurate, and all in all, are a pleasure to fire. The loaded drum makes for a rather bulky weapon but not really as bad as one might think. If there is any period in the complete history of the Luger where almost every rule is broken regarding models, variations, serial numbers, or anything on which a definite conclusion may be based, it is found in the post-World War I period. Perhaps the most important influence upon Luger production after that war was the Treaty of Versailles. This Treaty limited production to calibers not larger than 8mm and barrels no longer than 100mm, or 3 15/16 inches. These restrictions did not require a complete retooling by Luger manufacturers, however, as the pistol is so designed that by merely changing the barrel, and no other parts, the Luger is transformed from one caliber to the other! Because the standard military issue barrel was 4 inches, or l/16th-inch longer than the terms of the Treaty would allow, the barrel had to be shortened in order to conform. The Germans chose a barrel with a length of 3? inches or approximately 98mm. This model became known as the post-War Model, or the Model 1923. For all practical purposes, the Model 1923 was a Military Model of the 1908/14 type with the two differences of the shorter barrel and smaller caliber. Strangely enough, this Model 1923 was produced almost exclusively for export outside of Germany. The Germans themselves, theoretically restricted by the Treaty of Versailles, continued not only to use the 4-inch barrelled 9mm weapon but also to manufacture them for military and police use inside Germany. Also under the terms of the Treaty, Germany was permitted to retain an army of 100,000-man strength. These men had to be armed and they assuredly were. In the days immediately following the war, regular Military Models of 1908/14 were issued to this army. These were pistols that had either seen service during the war or were assembled from parts that had been finished but never issued. The only distinctive marking of these particular guns was a new date of issue added to the one already marked over the chamber. Consequently, we find the “two-date” model. (For example, a Luger that already had the date “1918” over the chamber now had “1920” above the “1918,” not superimposed upon it. Both dates may be easily distinguished.) These pistols were quickly relegated to the police, however, for whom the “second rate” weapons would suffice, and this double-dating became an outmoded practice very rapidly. In a very few instances, the “two-date” Model may be found with police or military markings on the forward part of the frame, just below the trigger guard. By 1920 the Germans had begun to manufacture or assemble (probably the latter), “as new” Lugers for the Army. These, too, were EXACTLY like the Model 1908/14 except that they were dated “1920,” “1921” or “1922.” As I recall, I have never seen any with dates other than these three years. These Lugers were of very fine workmanship, for this period, and appear to have been made entirely of new parts. Somehow the German Navy benefited by this “stretching” of the limits of the Treaty of Versailles, as Naval Model Lugers have been seen, precisely 1908/14 specifications in all respects, also dated “1920,” etc. and with no other date. Almost all of these types were caliber 9mm! A few have been encountered in caliber 7.65mm, however. Great numbers of ex-military issue Lugers were “rejuvenated” and heaped upon the commercial market. Some of these were rebarrelled with “as new” surplus military barrels and others were not rebarrelled at all. Almost all had the dates ground from the receiver ring. Original proof marks were often ground away also and replaced by commercial proof marks of that period. In some cases, the old marks were left on, and one or two commercial ones were added. An extremely interesting and unusual piece, whether it is of this period or not, is the so-called “Baby” Luger pistol chambered for the 7.65mm Browning, or .32 ACP, cartridge! This strange experimental pistol is reported as “smaller in the overall” than an ordinary Luger, or approximately in the same relation to a standard Luger as the “Baby” Nambu is to a large Nambu Pistol. Very few of these pieces were produced, the number reportedly not more than a dozen. One example has been reported as bearing the serial number “8” and with the DWM trademark on the toggle. No other specifications have been forthcoming. Another experimental Luger, certainly worthy of special note, is the “5-shot” or “Pocket” Luger, consisting of a shortened (possibly 2-inch) barrel, normal action and shortened frame, housing a 5-cartridge capacity magazine. The “5-shot” was one of extremely limited production, no more than one or two examples having been produced. Even before the machine pistol, or sub-machine gun as it is known in this country, first emerged as an accepted military weapon, attempts were made to convert the Luger pistol from semi-automatic to fully automatic fire. Though many attempts were made, none went beyond the experimental stages. This was, undoubtedly, due to the delicate trigger mechanism of the Luger and also to the fact that even in normal semiautomatic firing the ammunition used in a Luger must be fairly well standard in power or the various stoppages common to the Luger will occur. One very unusual Luger pistol is the Model 1908 of World War I vintage, with a 4-inch barrel and a 12-inch silencer about 1? inches in diameter. A threaded metal disc is permanently attached to the barrel in about the same position as the front sight, which has been removed; the tube, or body, of the silencer screws onto the disc. It is assumed that the tube was filled, at intervals, with rubber or composition baffles and possibly steel wool or some comparable material. Experiments were conducted at the factory in an attempt to perfect a silencer for the Luger pistol. These tests called for removing “0.36 gram of powder (from the cartridge) and replacing it with only 0.25 gram of powder.” This charge reduction was necessary because the bullet velocity had to be reduced below the speed of sound (1126 feet per second at 68 degrees Fahrenheit) or the silencer could not function efficiently. To further insure the lower velocity the weight of the bullet was increased. However, one problem remained – the silencer functioned as desired, but the pistol would fire only as a single shot. This was because “a Luger with silencer does not function automatically due to the heavier bullet and lesser powder charge, the gas pressure being too small to allow sufficient recoil for normal functioning of the action.” No record of further similar tests has been uncovered. By 1930 the confusion and restrictions of the post-war period had begun to relax and standardization again became the order of the day. Once more DWM changed hands, finally becoming a member firm of the same holding company that controlled the famous Mauser-Werke at Oberndorf on the Neckar. On May 1, 1930, 800 machines, tools and technicians were transferred from the Berlin branch of the DWM factory to the Oberndorf location. DWM then concentrated on the production of ammunition and Mauser became the foremost supplier of Lugers from that time until production was finally halted in 1942. While the changeover from DWM to Mauser was taking place, Simson & Co., continued to supply all Lugers to the German government. Their contract with the military was terminated in 1932, however, and no more Lugers were produced by that firm thereafter. About 1933, when Adolph Hitler rapidly ascended to power, steps were taken to legally sidestep most of the restrictions placed upon Luger pistol production. The point was argued, and won, that as cylinders of revolvers were not considered to be a part of the length of the barrel, neither then should the chamber of the barrel on an automatic pistol be considered when measuring barrel lengths. It was a small task to completely throw off the remaining restrictions and return to the old proven and desired ways of Luger production without the annoying regulations. Mauser continued to use the old DWM trademark until late in 1934 but in that year secret code names were given to the major producers of war material, and Mauser was assigned the code name “S.” The “S” was replaced almost immediately by “S/42.” At the same time, the commercial Mauser Banner trademark first appeared on Luger Pistols. There was a definite reason behind the using of both the code name “S/42” and the commercial Mauser Banner. The former were elements of secret production, employed to confuse the manufacturer’s identity. The latter was marked on arms supposedly intended for commercial sales, and a few of them actually reached the commercial market. Most, however, were destined for the rapidly growing German military forces of the early and mid-thirties. To doubly insure their carefully guarded secret from being discovered, pistols were not only marked with the code name but also with a code date of manufacture. Consequently we find “S/42” Lugers carrying the letters “K,” indicating manufacture in 1934, and “G,” indicating those made in 1935. Production under these circumstances did not get under way until late in 1934, so few pieces bearing the “K” designation will be encountered. Those marked with the letter “G,” or 1935, were in much greater evidence. By the beginning of 1936, the cloak of secrecy was thrown off and Lugers of “S/42” and “Mauser” manufacture, which were in reality one and the same, were marked with the actual dates in numbers over the chamber. It should be noted that the “K” and “G” markings appeared over the chamber in the exact place where the date would normally have been. The names “S/42” and “Mauser” were placed on the forward link of the toggle where the scrolled DWM trademark had previously been encountered. Those few Lugers intended for commercial sale carried only the “Mauser” marking, and were without dates or other stampings over the chamber. Examples were produced in both 7.65mm and 9mm calibers. All had barrels 4 inches long. Mauser, however, was not the only supplier of Lugers in the 1934-35 period – during that time another name was added to the growing list of Luger producers. It has been said Herman G?ring, Marshal of the German Air Force, had a personal interest in weapons produced by the Heinrich Krieghoff Waffenfabrik of Suhl. For one reason or another, G?ring decided that his Luftwaffe would be supplied with Lugers produced by that firm. In those days, however, demand far exceeded ability to supply, and the only manner in which any sizable quantity of Lugers could be obtained in a relatively short time was through the assembly of the millions of spare, or replacement parts left over from World War I. Krieghoff acquired the necessary parts, doubtless through his powerful political connections, and began to assemble the Lugers requested by G?ring Like the Mausers, these were marked with a code date, but not with a code name. Because their full production did not begin until 1935, Krieghoff Lugers are to be found bearing only one code date, an “S,” indicating the year 1935, stamped over the chamber. As Krieghoff’s capacity to produce was on a much smaller scale than that of Mauser, and also because he too marketed a small portion of his total output commercially, it was evidently not deemed necessary for the Krieghoff Lugers to employ a code name. Consequently, as did DWM, Krieghoff marked all of his Lugers with his commercial brand. The trademark of Krieghoff was an anchor, the upright body of which was formed by a dagger pointing downward, the letter “H” on the left side of the anchor and the letter “K” on the right. Directly below was the wording, in two lines, “Krieghoff” and “Suhl.” Some examples, however, bear only the word “Suhl,” the “Krieghoff” having been omitted. Others, some of which are marked only with the word “Suhl” and still others with both words, are found with the added markings “Heinrich Krieghoff Waffenfabrik, Suhl” in two lines on the left side of the frame.Pieces so marked will usually have a letter “P” preceding the serial number. Those Krieghoff Lugers having the letter “P” before the serial number, may not necessarily have the wording on the side of the frame, however. Guns with the “P” are examples of the few commercial Krieghoff Lugers placed for sale in both 7.65mm and 9mm. Areas over the chamber will be unmarked on these commercial pieces. The trademark is, of course, stamped on the forward link of the toggle. Beginning in 1936 Krieghoff, like Mauser, dated his products with the year of manufacture in numbers. Those Krieghoff Lugers with the code date “S,” or 1935 over the chamber were probably not serial numbered higher than #5,000. Pieces dated “1936” have been observed from the #5,000 series to the #7,000 series. Unlike those of Mauser manufacture, Krieghoff Lugers do not have a letter following the serial number, though with this one exception, they are numbered in the military system. A few examples may be encountered bearing dates of “1936” and “1937” which do not conform to the proper serial number range. These were pieces assembled from already numbered surplus parts at those later dates. Some of the Mauser-made Lugers will be found bearing not only the commercial Mauser Banner but also carrying a date-stamp over the chamber. Such arms were originally intended for commercial sale, but when the German military forces demanded more Lugers than normal Mauser production could supply, pistols previously set aside for the commercial market were merely stamped with a date and accepted by the Army as regular issue weapons. In 1936 the secret code names were augmented. Mauser was assigned the code number “42” in addition to the “S/42” already in use. It is not unusual, then, to find Lugers bearing the code name “S/42” and, for example, the date “1936,” and also to encounter “42” pieces having the same date. To add to the confusion, pieces were also produced bearing the same date, “1936,” and inscribed with the commercial Mauser Banner. In 1941 yet another code name was given to Mauser, in this case “byf.” Most examples of “byf” Lugers will have black plastic grips, a semi-successful experiment. These “byf” Lugers were in addition to and did not replace the “S/42”, “42” and “Mauser” types. According to reliable sources none of the Luger producing firms were permitted to sell their pistols commercially after 1940 or 1941. All production was claimed by the Wehrmacht, the German Armed Forces, who had the power to dispose of any surplus as they saw fit. In 1945 and 1946 a small quantity of Lugers were assembled from surplus parts left over from 1942, the year in which official production of the Luger pistol was superseded by that of the Walther “P.38.” These were put together at the direction of the French Occupation Forces, in whose zone of occupation the Mauser factory was situated. Exact amounts produced and specifications thereof are not known. Krieghoff, too, assembled a few hundred Luger pistols, in the period following the war, for American occupation troops. It was among these latter that the unusual pieces bearing no date and no name were found. After exactly 30 years of Army service in Germany progress finally caught up with the Luger when that Government adopted the Walther “Heeres Pistole,” or “P.38” (Pistol Model 1938), though production continued through necessity until 1942. Switzerland, which since 1924 had produced its own Luger pistol, followed suit in 1948, when the Neuhausen replaced it. The loss of World War II by Germany was the coup de gracefor the Luger. Countries that had been dependent upon Germany for their supplies of the pistol were forced to turn in other directions when their orders could no longer be filled by the Mauser Werke. Regardless of the fact that it is no longer produced, the Luger is not a “has been” by any means. Over a period of 40 years literally millions were produced, most of which are today in the hands of the military the world over. There are thousands of soldiers, marksmen and gun fanciers to whom it will never lose its value as a weapon for defense, shooting, or as a collector’s item. Quite possibly Luger production may never again be resumed. Should this prove to be true, all Lugers, especially the rarer ones, will increase in value and the demand will grow. No matter which course the armies of the world pursue, the Luger pistol is now and shall always remain one of the greatest handguns in history. Wonderful write up. A minor typo on the Image of the Dished Luger cartridge counter Luger it should be 1902 not 1092. Always interesting to read from the best. Great article need more like it on the wide spread Luger.